Today marks the 111th anniversary of the end of the Boxer Rebellion. Inspired by anti-imperialist sentiment and religious mysticism, the Boxers were a nationalist Chinese group which rose up against Westerners across China in late 1899. Thousands of Chinese Christian converts, Western missionaries and other Western ex-pats were slaughtered in the ensuing violence. The Rebellion culminated in a 55 day siege of the foreign embassies in Peking which was finally lifted when 20,000 troops from Austria-Hungary, Germany, Great Britain, France, Italy, Japan, Russia and the US fought their way into Peking. 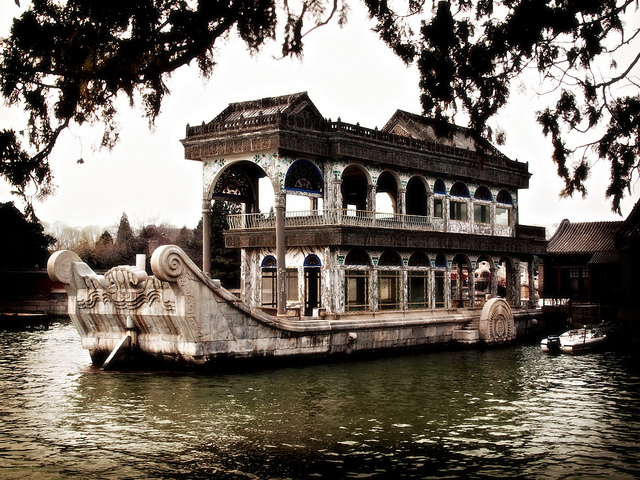 In a strange twist, the Boxer Rebellion owes much to the marble edifice pictured above – the Marble Boat on the grounds of the Summer Palace in Peking. Originally built in 1755, the structure was renovated in 1893 by order of the Empress Dowager Ci Xi with funds intended for modernizing the Chinese navy. Instead of funding the construction of a modern navy that could have kept Western forces at bay and prevented the further divvying up of China between competing Western nations, the Chinese built a ship useful only for delighting courtesans and guests of the Empress.